Midnight Mass, the Christmas Tree, carol singing, the giving of presents - these are all traditions which the Poles share with other European nations, though other customs like hanging elegant Christmas stockings are not widely followed. Family arguments, dodgy pop songs and spicy dishes which children aren't necessarily desperate to eat - those are not ruled out either. But let's not get carried away with the Scroogey side of Christmas (although it would be interesting to find a good Polish translation of the word 'humbug') as Poland has many marvelous traditions of her own, some of them deeply moving. Of course, here in Cracow, the White Christmas that we all yearn for is the norm, which adds a delightful dose of magic to it all. After a fresh dash of snow, the Planty gardens - replete with their nineteenth century oil lamps - take on an almost Narnian aspect. 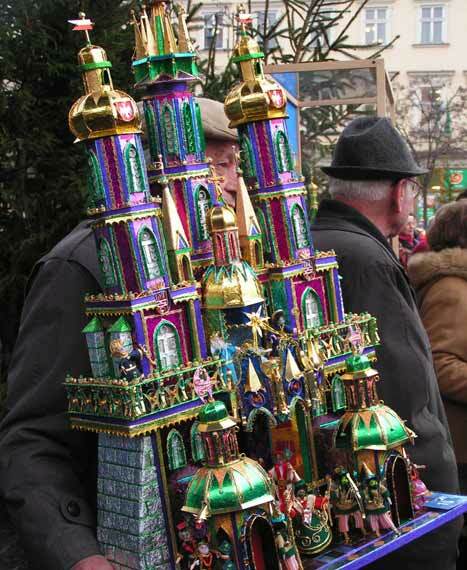 Szopki (Nativity Scenes) These are often translated as cribs, but the classic Cracovian szopka (pr. shopka) looks more like the kind of coloured castle that you find in a Russian fairy tale. Nevertheless, the artists draw on distinctly local features for their inspiration - the towers of St. Mary's Church, the Barbican, Wawel Cathedral - all these are recurrent motifs. In the olden days, nativity scenes provided a pleasant way of making a bit of extra cash for masons. When snow stalled construction projects, craftsmen would sell szopki and other ornaments for Christmas to well-to-do Cracovian households. In more recent times, an annual competition was instated, partly as a means of keeping the tradition alive. This entered its 63rd year in 2005. The contest begins every year on the first Thursday of December, when the entrants (including everyone from youngsters to jovial old grandpas) bring their creations to the Mickiewicz statue on the Market Square. At midday, the bugle cry announces that the scenes should be whisked away to the Historical Museum, where judges will decide on the winner. The following weekend the winners are announced and the year's pickings are put on display. Whilst in the past, szopki were often made of wood, a coloured-foil finish has become the norm nowadays. On a bad example this can appear decidedly garish, but the better szopki are fantastic even if for their ingenuity alone. A decent szopka can take more than 600 hours to construct, and they're full of idiosyncratic details - some humorous and others straight from the heart. Wigilia (Christmas Eve) Wigilia (pr. Veegeeleea) is the most sacred day in Poland's yuletide calendar, culminating in the breaking of the 'oplatek' blessed wafer and sharing holiday wishes with loved ones, often a deeply emotional moment. The central element of Wigilia (The Vigil) is a twelve course dinner without meat, the number of dishes symbolizing both the months of the year and the twelve apostles. A dash of hay is placed on the table, recalling the manger, and the celebration begins when the first star appears in the sky. Oplatek Before the banquet begins, pieces of 'oplatek' are handed around, and prayers are said. Thoughts turn to those members of the family who are not present, and an intensely reflective atmosphere takes hold. The tradition of oplatek took off during the nineteenth century when many Polish families were separated, most famously after waves of patriots were dispatched to Siberia for rising up against Russian rule. Blessed wafers were sent to relatives in exile and divided families held parallel observances. Although an oplatek is inexpensive today, they often come imprinted with beautiful seasonal imagery. In the countryside, farm animals are also given oplatek as it was they who first greeted the baby Jesus. On this night, it's believed that the goodly animals talk in human voices. Many charming old photographs and exhibits on these themes can be found on the first floor of Cracow's Museum of Folk Culture. Wigilia Dinner As in many countries, some Christmas dishes, such as the ubiquitous carp, are not always a hit with all the family, particularly youngsters. However, most Poles love their Wigilia dinner, a 12 course feast that traditionally kicks off with a soup, usually beetroot (barszcz), often with dumplings. A common selection of dishes might include variations on herring, pike and carp recipes, a good range of vegetable dishes, dumplings with mushrooms and cabbage, poppyseed and honey cakes, and fruit compote. Quite often an extra place is laid at the table in tribute to the infant Jesus. It's said that should a stranger happen to knock on a family's door during wigilia, the family will welcome him in, with an extra place ready for him. Poles take it seriously and alcohol is not generally imbibed, something of a rarity in this part of the world, we must confess. Choinka (The Christmas Tree) Poles are very much attached to the Christmas tree tradition. In the lost eastern borderlands, Poles cultivated the idea that an angel comes and leaves the presents beneath the tree. There are regional variations, and in Wielkopolska some maintain that the 'little star' magically brings the presents, but this is not a nationwide custom. Pasterka (Midnight Mass) With all the banqueting and present-giving out of the way, most Poles head to church for Pasterka. Carols (Koledy) are sung before the mass itself begins, and the service is a spirited occasion that's full of energy. The Gathering of Kings There is one final tradition on Wigilia, and in this case it's entirely peculiar to Cracow. When the cathedral bell tolls midnight, a pair of enchanted knights wake from their slumbers. They emerge from a hidden mountain cavern and gallop through the night to Wawel Castle. There, in a mysterious crypt beneath the citadel, Poland's long-fallen monarchs gather for a solemn meeting. The knights knock at the chamber door and King Boleslas the Brave rises from his throne. we celebrate the traditional polish christmas eve meal and customs but we call it "Pushneek". I know it is spelled wrong but our parents called it that. I cannot find any reference to that word and my parents are dead so I can't ask them. Does anyone know what Pushneek is? my boyfriend is polish & im scottish,i didnt realise how special xmas is 4him! !wish i had come across this earlier :-( merry xmas all! I am first generation Polish - so my family celebrated Wigilia, and it is certainly a beautiful custom and tradition. This information is useful, but there could have been more elaboration. We have 13 course dinner, and 'oplatek' flat bread we share between eachother on the beggining of supper-with it we are wishing the other person what ever this person needs-such as health, passing exam in comming future, money and so on. Thank you I am doing a report about Poland. MY GRANDPA WAS FROM KRAKOW AND WE CELEBRATE WIGILIA EVERY CHRISTMAS EVE. IT IS THE BEST TRADITION. God made poles to show His lightheartedness and give to us some of the best recipes in the world. I'm a third generation pole myself. The Lord has blessed me with two children and a lovely wife. Appreciate the comments they definitely are from the heart. I am a first grade teacher writing a holiday unit on Christmas traditions around the world. One of my students is of Polish heritage. Thank you for giving me all I need! I will be in Krakow the first week in December,3rd visit this year, so will be looking forward to the buzz and atmosphere, but was wondering whether the christmas markets will be in full swing this early in Dec and if it is usual for snow to fall in early December as the planty resembling Narnia conjures up such romantic images that i have come to love about Krakow and its people. This was an absolutely wonderful and informative article. I am the offspring of a Polish father and an English mother, but they have now passed away, so it's very helpful to read descriptions of holidays such as this. I thought it was really good and I am doing a project on poland. I am so excited to prepare a perfect Polish Christmas for my wife. She moved from Krakow to spend her life with me in Boston. Does anyone have a good recipe for Christmas Carp? I THINK THAT POLAND HAVE LOVELY CHRISTMAS SONGS. BUT MY FREND IS TEACHING ME 1 GOD IS BRON MY FREND IS CALLED KASIA SHE IS COMING BACK TO POLAND IN 7 DAYS SO WE ARE GOING TO MISS HER. WE ARE ALL VERY SAD TO SEE HER GO. I love the description of Polish Christmas traditions. I would like to add one more - when we prepare Christmas Eve dinner we leave one spare plate for a stray wanderer who has no home to spend Christmas in. It comes from a tradition of leavuibg some food for the souls of our ancestors who had passed away.